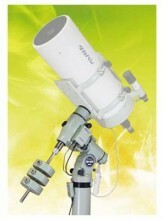 The ML mount as shown above uses a detachable counterweight shaft. This new arrangements adds the equivalent of one 5 kg weight to the shaft, so that two weights become the equivalent of three weights. The price of the EM-200 T-2M ML is the same as the standard model. The specifications other than the counter weight shaft are also identical. The mount was modified to allow the Mewlon-250 CRS to be carried with three counter weights instead of four. Click the button below to add the Takahashi EM-200 Temma-2M ML GoTo Equatorial Mount to your wish list.